Kevin Folta’s libel case against the New York Times makes the internet’s reaction part of the point. Can You Sue a Newspaper Based on How the Internet Interprets a Story? A pro-GMO professor who claims he has been defamed by the New York Times’ reporting on his connections to Monsanto is trying. But that doesn’t mean he’ll be successful. 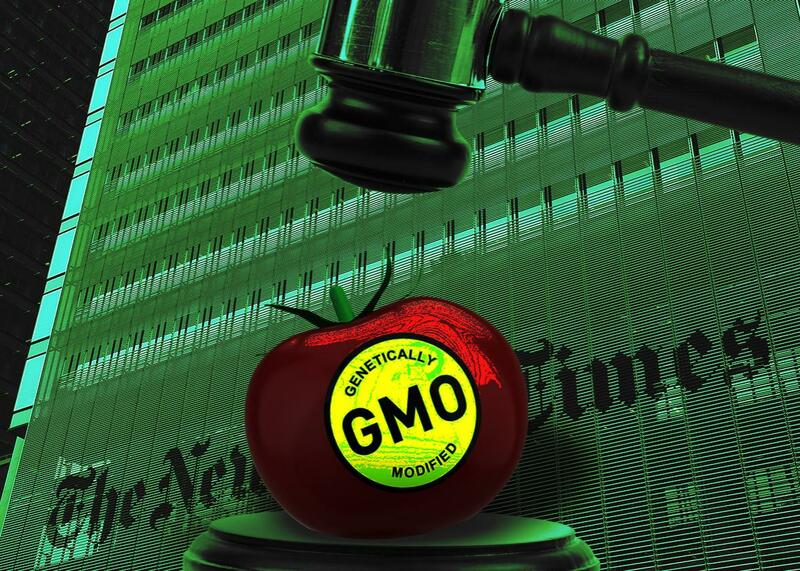 Writing about GMOs is fraught—just look at this lawsuit. Photo illustration by Slate. Photos by iStock and Spencer Platt/Getty Images. In 2015, Eric Lipton, a two-time Pulitzer Prize–winning investigative reporter, published a long expose on the front page of the New York Times that delivered on its headline: “Food Industry Enlisted Academics in GMO Lobbying War, Emails Show.” The story was published in the wake of an academic arms race, of sorts, that occurred between the organic food and agricultural biotech industries as they prepared for the fight over GMO food labels. Both industries had “aggressively recruited” independent academic researchers, Lipton wrote, in a bid to influence public opinion and policy. I was deeply interested in Lipton’s story because I had reported on some of the most eye-opening aspects of these emails for Nature several weeks before his Times piece appeared. It was both gratifying and frustrating to see some of the fruits of my labor appearing in the paper of record. Now, two years later this story is back on my mind because last month, Lipton’s article become the subject of a libel suit (mine has not). An objective reader of Lipton’s piece would have to acknowledge that neither Team Organic nor Team GMO comes off well. Both were shown to have high-profile scientists who had deeper working relationships with their respective industries previously unknown to the public. So why, two years later, are Lipton and the Times being sued in federal court for defamation by only one of those side’s “enlisted” academics? The answer, I believe, can be traced to how the story played out on the internet after it was published and how the internet has polarized the conversation around GMOs. Lipton’s piece sparked a backlash on social media—mostly against Team GMO. One scientist in particular, University of Florida molecular biologist Kevin Folta, bore the brunt of the wrath. And Folta is the one who has decided to sue Lipton and the Times. Just over a month after the Times story, a long BuzzFeed article raised additional transparency issues for Folta, about a podcast he had hosted under a pseudonym. The BuzzFeed piece triggered another wave of online bile that sent Folta reeling. At this time, he was lashing out so much that he said University of Florida administrators ordered him to stay off Twitter (a dictum that lasted for a few months). So Folta is not blameless. He reacted defensively to legitimate issues of transparency highlighted in the Times and BuzzFeed articles, and willingly traded barbs with his detractors. That said, I’m sympathetic to Folta’s plight and to his embittered state of mind. I’ve been writing about GMO issues off and on since 2012, including at Slate, and this has put me in the crosshairs of activists, “health rangers,” and trolls—an unpleasant experience I wrote about last year in Issues in Science and Technology. Because of this, I now have to explain to my young sons, after they google their father, that I often write about controversial topics and that this causes certain individuals and organizations who feel strongly about these topics to sometimes distort and misrepresent my work online. As my wife likes to remind me when I complain, this comes with the territory. The Philadelphia law firm that Folta hired has climbed that hill before—numerous times. It has a successful track record with media libel cases. And in the wake of the recent Hulk Hogan legal victory against Gawker, secretly financed by Silicon Valley titan Peter Thiel and surprisingly successful in extracting a high enough cost ($140 million in damages) to shutter the website entirely, these types of suits feel more frightening for all of us in journalism. There are real (and legitimate) concerns in media circles about a chilling effect from such “revenge litigation,” particularly from ideologically motivated billionaires. Can online blowback be the basis for a libel suit? Perhaps, but not in the way you might think: “There’s no question that the internet changes the calculation,” says Jonathan Adler, a law professor at Case Western Reserve University. But the “online scar” Folta attributes to the Times story “is most likely to be relevant for damages purposes,” Adler says. “That is, the fact that one news story can be so widely distributed and reproduced is a way to show that Folta was actually harmed. I am not sure, other than in terms of atmospherics, how this helps establish the underlying defamation claim.” In other words, it could decide the damages but it likely won’t have much influence on the ruling. The amount of blowback Folta received seems to me to be less a product of Lipton’s reporting as it is of his framing. Folta’s beef with the Times story is that he thinks it was constructed in a way that painted him in a “false light” as a Monsanto stooge, which allowed other people to pile onto that framing, causing Folta harm. (Folta claims in his lawsuit that Lipton had this preconception and even asked him at one point in their interview: “How does it feel to be a tool of the industry?”) The “false light” argument is at the core of Folta’s defamation claim against the Times. As someone who is familiar with the fraught debate around GMOs, and how slanted media coverage has sometimes contributed to widespread misinformation and faulty narratives, I know how powerful, and how tricky, journalistic frames can be. And when it comes to GMOs, there almost is no middle ground, meaning that any frame will be cannibalized by people on either side. Whether Lipton’s framing of his story was negligent to the point that it allowed readers to conceive Folta as something he is not is a complicated issue to litigate. But this much is clear: Lipton can be held accountable if he got the facts wrong, but he cannot be responsible for the internet’s interpretations of them.